Nichijou is a little slice of life show about a bunch of eccentric schoogirls that’s reminiscent of Azumanga Daioh– however, despite the title, “My Ordinary Life” delves much farther into the realm of the absurd than AD ever did. Sometimes, this works nicely- the random nature of the gags can be laugh-out-loud funny, and I love the kid who rides a goat to school. It helps that this is one of those shows where the animals are all beyond adorable. However, sometimes- like with the character Misato and her ever-expanding arsenal of gattling guns and rocket launchers- it just seems like it’s desperate for your attention. Other parts, like the ongoing story about Nano the robot (who is a lot like Azumanga Daioh’s Osaka would be, if she were a robot with low self-esteem) and a tiny mad scientist have their moments, but seem to be missing something- like it’s supposed to be funny for some reason I’m just not getting. The girls also haven’t really come into their own- their personalities remind me of characters from other shows (I’ll bet you can guess which one), and while there’s nothing wrong with that- there’s a reason why character archetypes work- there’s nothing to really pull you into this show over it’s genre-mates. On the plus side, I like the fact that the girls are over-the-top freaky instead of cute and cuddly- their craziness, and frankly, stupidity, remind me more of my own school experience than perhaps is healthy. That same craziness and stupidity does grate after a while, however. For example, the sequence in Ep. 2 where Mio races to get her notebook, featuring a naughty drawing of her and her crush, back from Yuko is funny, but the end kind of ruins it. So she gets her notebook back, relieved that now, no one will ever see her shameful doodle and then hands it in to the teacher two seconds later? There’s funny-stupid, and then there’s “too stupid to live,” and these characters are knocking on that door. 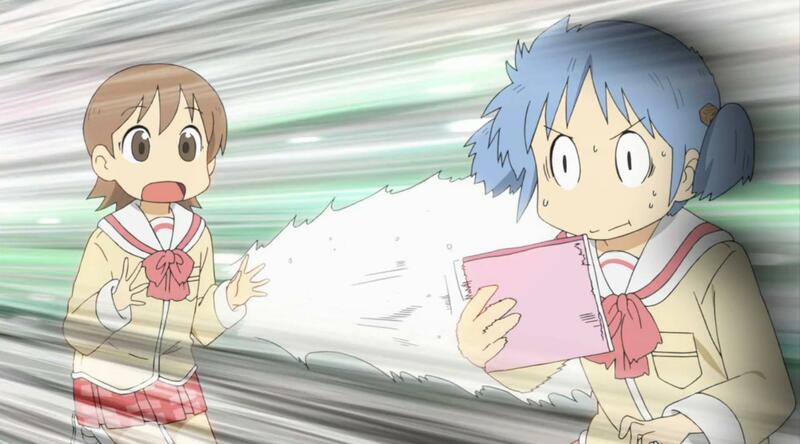 I’m going to keep up with Nichijou for the time being, but I hope it sticks to it’s strengths- bursts of random “where did that come from?” humor- while still calming down enough that it doesn’t seem to be terrified the audience will get bored and turn it off at any moment. Maybe those two goals seem mutually exclusive, but I don’t know- quirkiness doesn’t have to be delivered faster than the speed of light. Also, credit to the series for some of the more subtle idiosyncrasies- I like the fact that every video game console depicted has to be at least 20-25 years old.